March Picks: St. Patrick’s Day in SF, Sacramento, & Martinez; Berkeley Jazz; SF Russian Festival; and the Silicon Valley Auto Show! 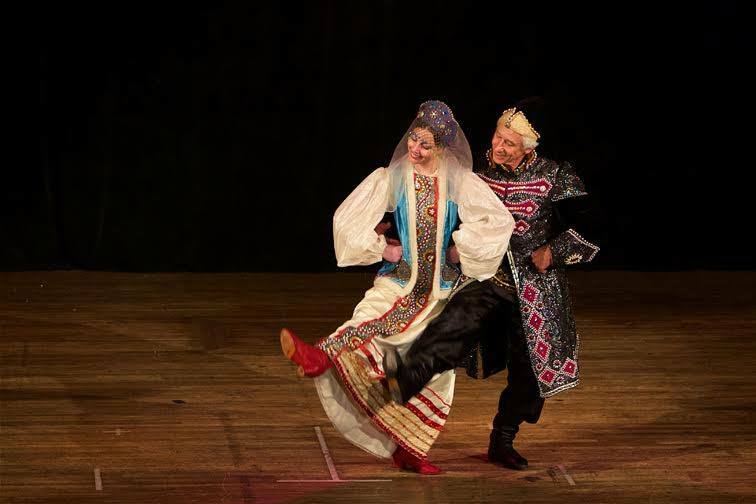 If you like jazz, flashy new cars, Russian culture, the Irish tradition of St. Paddy’s, or supporting good causes, this month’s events won’t disappoint— especially when the convenient, relaxing Capitol Corridor can get you there! More March Picks: St. Patrick’s Day in SF, Sacramento, & Martinez; Berkeley Jazz; SF Russian Festival; and the Silicon Valley Auto Show! Taking the Capitol Corridor is a convenient and relaxing way to visit family and friends during the Thanksgiving holiday week. Keep in mind this is also our busiest period, so you’ll want to plan your travel in advance, and read our Holiday Travel Tips from the blog, to ensure a smooth and enjoyable travel experience. 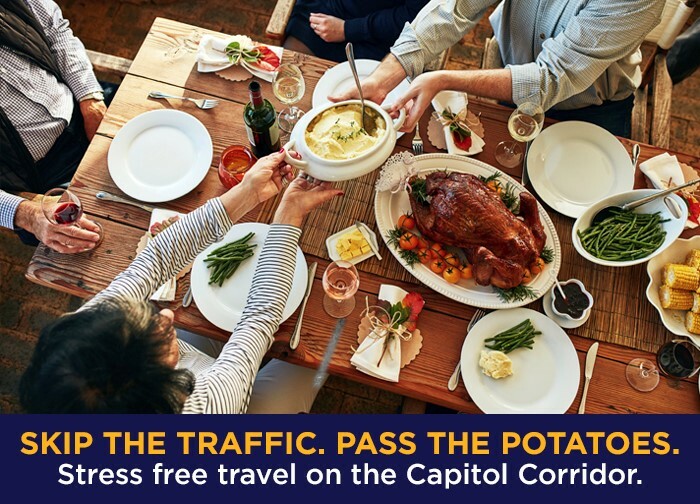 Following is important information about the Capitol Corridor’s Thanksgiving week service. Train and bus service on Thanksgiving Day, Thursday, November 22, and on Friday, November 23 (in addition to Saturday, November 24 and Sunday, November 25), will operate according to the Weekend/Holiday schedule. To accommodate the unusually high ridership, particularly on the Wednesday before Thanksgiving and the Sunday after, we will have additional cars available for select regularly scheduled trains. *Then regular schedule to Stockton. Please keep in mind that many connecting bus routes require reservations and fill up fast. We encourage you to book early, and if possible, avoid travel on the busiest days — the day before and the Sunday after Thanksgiving. Once you’ve booked your ticket, there’s no need to print it; you can pull up the PDF of your ticket (with the QR code) on your phone and show the conductor. Got luggage? Please review Amtrak’s baggage policy. You may bring two bags and two carry-on personal items, collectively weighing up to 150 pounds, for free. Excess bags will cost $20. We look forward to welcoming you aboard the Capitol Corridor this holiday season. Happy Thanksgiving and safe travels! Check out a great selection of free, family-friendly, Autumn-inspired events throughout the month of October. 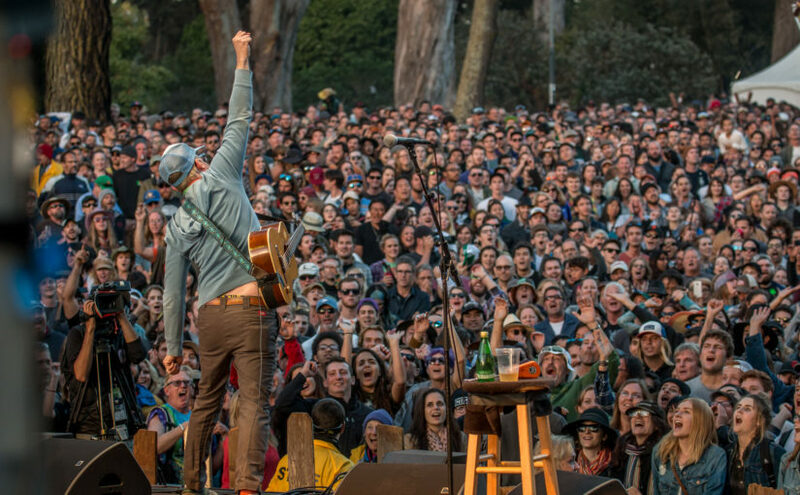 From jamming out at a free three-day music festival in SF, to celebrating Día de Los Muertos (Day of the Dead) in SJ, discover the best things to do around the Bay Area and along the Capitol Corridor! Win tickets to San Jose Jazz Summer Fest!